On 30 April 2014, the Hellenic Presidency of the Council of the European Union, represented by the Ambassador of Greece to the UN in Geneva, Alexandros Alexandris signed the Treaty to Facilitate Access to Published Works by Visually Impaired Persons and Persons with Print Disabilities also known as the Marrakesh Treaty on behalf of the European Union. The signing ceremony took place at the headquarters of the World Intellectual Property Organisation (henceforth WIPO) in Geneva during the organisation’s Standing Committee on Copyright and Related Rights (SCCR) taking place from 28 April to 2 May. 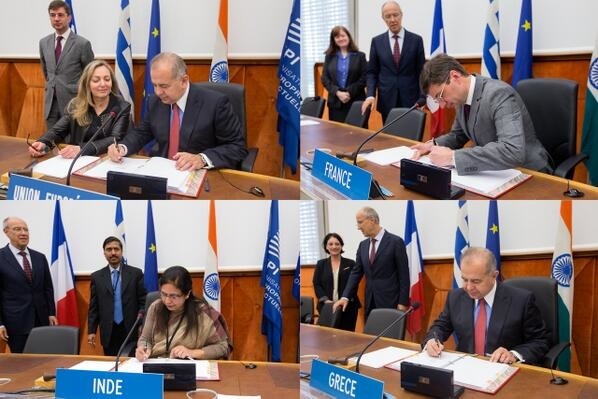 France, Greece and India also signed during the ceremony in the presence of WIPO’s Director General Mr. Francis Gurry. This brings the total number of signatories to 64. This international binding UN/WIPO treaty for the first time aims at ending the “book famine” that deprives 250 million people of access to culture and education. Visually impaired persons only have access to between 1 and 5% of the books published. The agreement focuses on copyright exceptions to facilitate the creation of accessible and affordable versions of books and other copyrighted works. It sets a norm for countries ratifying the Treaty to have a domestic copyright exception covering these activities, and allowing for the import and export of such material. Irini Stamatoudi, Director General to the Hellenic Copyright Organisation in her speech referred to the fact that the Presidency“ has put its best endeavors to have the decision of the signing of the Marrakesh Treaty by the EU adopted as soon as possible and we succeeded in this goal”.She also stressed that“we want to convey a strong message that we want this Treaty to work and serve its original purpose”. India pledged to ratify the Treaty by the end of May 2014. India will be the first major world power to ratify it while numerous lessons can be learned from the country’s preparation in order to put the Treaty into effect. There is still considerable work to be done as many EU member states have not yet signed let alone ratified the Marrakesh Treaty even though it has been almost a year since its conclusion. For the Treaty to come into effect, ratification by 20 countries is required. Executive Director of the European Blind Union (EBU) Central office Mokrane Boussaïd stated that when the treaty is ratified it will open up “huge new opportunities for over 30 million blind and partially sighted people living in Europe in terms of access to information and culture, as well as people with other print disabilities.” He also called for a speedy ratification of the treaty in signatory countries. Ratification must be as widespread as possible, he said, because only organisations in countries which ratify the treaty will be able to exchange books under the terms of this treaty. The figure used since 2010 by WIPO is 340 million blind, visually impaired and other persons with print disabilities. This number has been repeatedly used by WIPO and others without any indication of its source. The WBU itself uses the WHO number of 285 million people who are estimated to be visually impaired worldwide which would leave (only) 55 million people worldwide with other impairments that might be eligible under the Marrakesh Treaty. So from where did you source your 250 million figure? The WIPO Marrakesh Treaty at 5.4.b limits the copyright exception ‘to certain special cases’. Some people use numbers for the eligible worldwide population in support of Treaty ratification that may be less than half of those used by other organizations such as the CNIB and those above..
Maybe there is a low-balling of such numbers else the class of ‘certain special cases’ could be in a range some might argue does not conform to and exceeds what might reasonably be called ‘certain special cases’.